Home Unlabelled Kia Rio and Spotify Bring the Best Songs to Play with Your Windows Down! Kia Rio and Spotify Bring the Best Songs to Play with Your Windows Down! Most of us were really music lover! Myself is truly a living proof! I love music! In my office, I always have my headphone plug into my ears to listen to the my favorite mp3 collection. Even in my bed, the radio is open serenading me with music 'till I sleep! As a music addict, I always ensure and update my playlist with the latest hit music. Thanks God that there's a newest application that will bring us your favorite songs with your windows down! Kia Rio and Spotify partner to develop the "Best Songs with your Windows Down" playlist. Users can contribute a song to create a playlist via the Spotify application or the Rio Playlist tab on the Rio Facebook page. First, visit http://www.facebook.com/kiario… and search for your favorite song to play with your windows down. Then, choose your song, enter your name and email and click "submit!" Be sure to click on "view playlist" so you can see all the songs submitted by others. Oops, you'll have to download Spotify to enjoy the playlist if you don't already have it downloaded. Be sure to choose the application "Spotify" when the new application tries to launch. 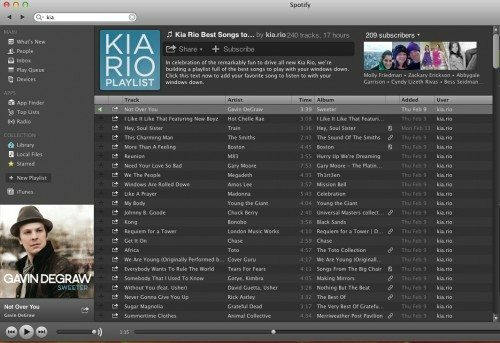 Finally, enjoy the "Kia Rio Best Songs to Play with Your Windows Down" via Spotify! Great! "Best Songs with your Windows Down" playlist is always best to play with your car! It's because of it ease and convenience anytime, anywhere! Cool! Well, if I were to ask you, if you were to submit other songs, which would you choose?! So, start submitting your songs and leave a comment here in this blog post about the songs you have submitted! Of course, tell me why you chose those! Now that you have your playlist, go on with it! Go back and see all the new songs everyday! Nice! Moreover, there is also a Voice-Activated UVO Infotainment System powered by Microsoft which adds great feature to your playlist!